I want to thank all of you for your kind words, thoughts, prayers and hugs before and during my surgery! My surgery went really well, actually better than expected, considering I had to spend 2 nights in the hospital for what was supposed to be a same day surgery. I have to say that I truly have THE best doctor in the world...I mean how many doctor's pray with you and your family before you go in for surgery?! Mine did and it was truly amazing! I am so thankful to have been referred to him and to have him taking care of me and working to improve our chances to have children! I am so happy to be feeling better every day and I will be returning to work on Monday. As much as I enjoy being home and doing more "Betty homemaker" kind of stuff, it will be good for me to get back to reality sooner than later. I could get spoiled very quickly being at home!!! I have been scrapping, and have a few LO's that I need to add the journaling too. I have been a bit lazy with that lately. Do you ever do that with your LO's? I find that if I don't do my journaling right away, the LO just sits there and sits there. Tomorrow, I have vowed is going to be "finish the journaling" day! LOL!!! But seriously...I am going to do it tomorrow! Scrapbook Doodle is having a ton of fun with their Doodle Dayz of Summer challenges! 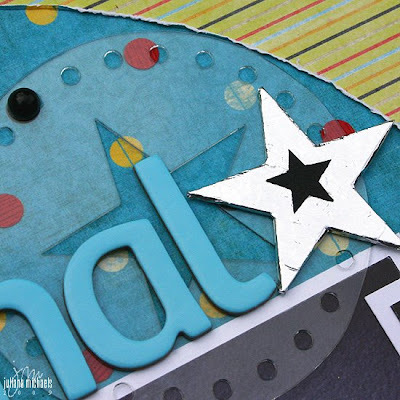 Stop by for a ton of great ideas, inspiration and scrapbooking fun! Mix It Up is having a DT call! If you have ever wanted to be a part of a challenge blog DT this is a great one to be on. The "boss" Melanie is so fun and easy to work with and the mixers are so fun and inspiring! Check out all the details here. 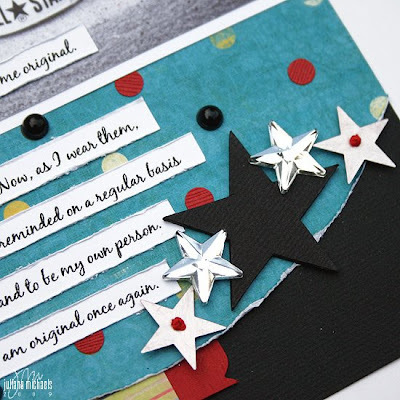 This week’s mixer is a design inspiration - seeing stars! You must include a minimum of 5 stars on your layout. Those 5 stars must be made of different material, foil, pp, cork, metal, ribbon, etc... Let your imagination run wild! I went pretty much by the book with the sketch with the exception of my journaling. I ended up writing more, so I just spread it up the page! LOL!!! 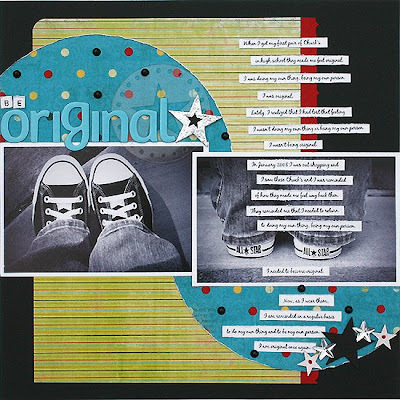 As for the 5 stars part of this challenge…I was immediately inspired to scrap these photos of my Chuck Taylor’s. Thanks for stopping by! I hope you are having a great start to your summer!!! I'm so glad you doing great!!!! Thanks so much for the info on that stamp!!! That's a great LO!!! I have been stalking the Mix it Up site for a while (because of you!) and am thinking about trying out. I think that the mixers are a GREAT idea and your layout for the new mixer is amazing!! I love love love the stars!!! I absolutely LOVE what you did with this sketch Juliana!! ANd yes...I hear ya on the journaling thing! That's so awesome that you got a terrific Dr. Amazing that your Dr. prayed with you first. I'm glad all went well! So adorable! I love that sketch and your layout! And I love that you photographed your chucks from the back, too! We're a chuck taylor family - tony, both kids and I all have a pair, lol! SO glad the surgery went well!! I adore the topic of this layout! and I love the journaling, the offset circles add so much and help the eye flow from picture to picture! The bright colors are so fun and upbeat!!! Good to hear that you are feeling better! Love your layout, it's amazing! The details are fantastic! I need to make some time to work on a layout to submit for Mix it Up, looks like a super challenge blog. I'm so happy to hear you're doing good! !